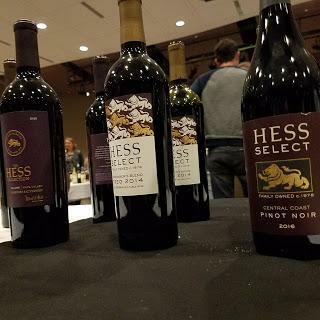 My first experience with Hess Collection Wines was at the Wine Bloggers Conference in 2009 and I remember having lunch on their Mount Veeder estate with the goats. Now looking back, that was their first year with the goats, having purchased 24 goats in 2008 and they all turned out pregnant. I remember them telling us the story and we were eating with the offspring. 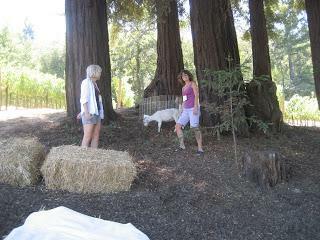 Those goats play an important part of vineyard management during bud break. They help with the weed control, minimizing the use of the tractors and tilling. I totally enjoyed the wines then and still do so today. The only thing I do want to do my next trip to Hess Collection (besides taste the wine) is see the art museum, it is suppose to be amazing. In the meantime, we can explore their wines. For this article we are going to visit the Hess Collection 2015 Napa Valley Chardonnay, 2015 Hess Collection Allomi Cabernet Sauvignon, Napa Valley and Hess Collection Mount Veeder Cabernet Sauvignon 2014, Napa Valley. Next month we will explore some of the white wines of Hess Collection.A little quick background on Hess Collection. Donald Hess came to California from Switzerland in the mid 1970’s. He wanted to expand his Swiss based bottled water company but instead fell in love with Napa Valley and the wines. He purchased 600 acres of land on Mount Veeder because he felt the best grapes grow on mountains, hillsides, ridges and bench lands. In 2011 Donald Hess retired and the fifth generation of Hess Family took the leadership rolls.Label note: The tiger on the label signifies the three different generations of the Hess family. Hess Collection 2015 Chardonnay $22This Chardonnay comes from the Su’skol Estate Vineyard in Napa. It is located in one of the coolest growing regions in the area. The vineyard is named after the native Su’skol people who used the area as a meeting place and valued the areas resources for fish and game. The vineyard is on a site of ancient seabed with shallow, sandy soils that Chardonnay grapes love.Tasting notes: An elegant complex Chardonnay that has been aged 9 months in barrels. Layers of apple, pear, honeydew melon and pineapple seductively work their way through your palate. Enjoy this next to fireplace and have a romantic evening. 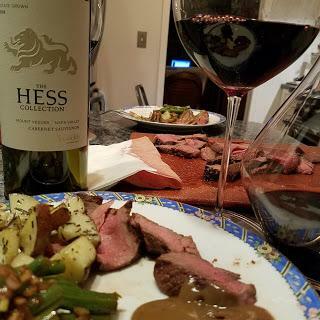 Hess Collection 2015 Napa Valley “Allomi” Cabernet Sauvignon $32This comes from the 210 acre Allomi Vineyard that has 35 six different Cabernet clones which add to the dicersity of flavors in the wine. The wine has 92% Cabernet Sauvignon, 6% Petite Sirah and 2% Petite Verdot and was aged in oak for 18 months. Twenty-five percent of the oak was New American oak.Tasting notes: A complex wine full of dark fruit, back cherry, currant, tobacco, vanilla, cocoa, nice integrated tannins. Hess Collection 2014 Mount Veeder Cabernet Sauvignon $65This comes from their estate Veeder Hills Vineyard. This cineyard has steep slopes and elevation ranges from 600 to 1,120 feet with sedimentary clay and shale soil. The berries are small with intense fruit flavors. The wine is a blend of 81% Cabernet Sauvignon, 16% Malbec and 3% Petite Verdot aged for 22 months in barrels with 80% in New French oak.Tasting notes: Strong aromas hit your nose as you decipher the layers of black fruit, plum, leather, blackberry and cassis. Strong layers of black fruit on the palate, a very robust wine, strong and powerful with polished tannins that integrate nicely but stand their ground. Some nice mocha spice on the finish.